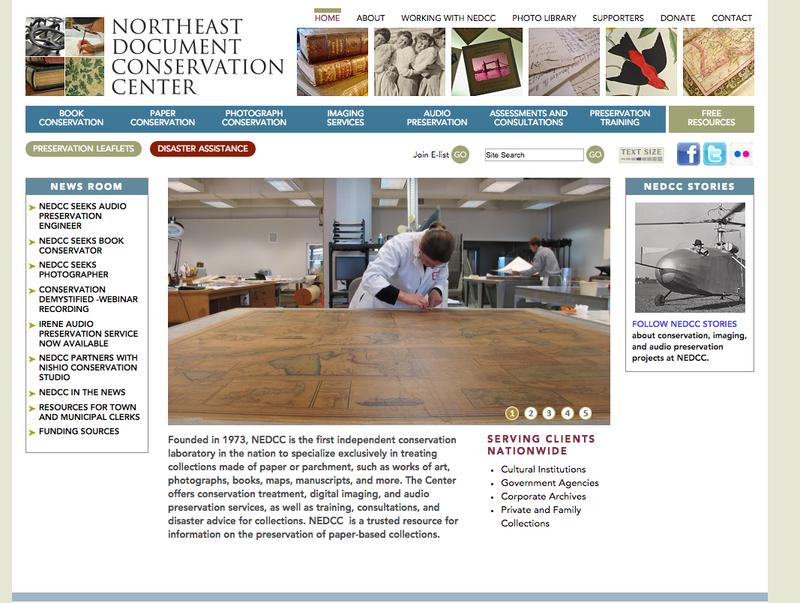 The Northeast Document Conservation Center (aka NEDCC), based in Andover, MA 25 miles north of Boston, is hiring a full-time Photographer. The position description and application instructions can be found here https://www.nedcc.org/assets/media/documents/Photographer%20Job%20Posting%20-%209-18-15rev.pdf. We are one of the world’s leading authorities on conflict and its impact on people’s lives – from 1914 through to the present day and beyond. Our collections are filled with personal stories and experiences, inspiring powerful and often conflicting emotions. We aim to share these stories with as many audiences as possible across the world in a way that engages and challenges them, increasing understanding of why we go to war and the effect that conflict has on people’s lives. In other words, we expect our stories to change the way people think about war. We rely on our staff to help us achieve this aspiration. You should be able to demonstrate the skills and competencies set out below, but equally we are looking for people who believe in what we do and who we are, and can treat every colleague, customer or visitor with respect, courtesy and honesty. We expect our staff to work flexibly and with enthusiasm. These are the qualities that make IWM such an extraordinary place to work. The Digital Operator is a skilled image specialist working in a team of creatively minded people. They are adept at using a wide range of high end capture hardware and are intuitive in the use of various software packages. All computer work is undertaken on Apple Mac machines with high quality calibrated screens in a colour managed environment. A high level of concentration and attention to detail is a pre-requisite as are “an eye” for the image. Staff working in this area support each other with learning and keep abreast of current developments. The material for capture ranges from small posters, to photographic prints and negatives as well as maps, documents and microfiche all captured to an exacting archival standard. The majority of work undertaken is project based and specific training on the various hard and software will be given. Examples of past and current project are Their Past Your Future scanning 24,000 negatives over 24 month period, On the Case CWR 3,500 paper items over 48 months and Q series negatives 115,000 over 30 months. Working with pre-existing image files you will also be part of a team that prepares content to our client base both within and without the organisation. You will be expected to work independently as well as across different teams in order to contribute to and deliver the priorities of IWM – using your knowledge, skills, talent and potential to the best of your ability. You will focus at all times on delivering excellent customer service, ensure value for money at all times while being professional, courteous and demonstrating the behaviours and attributes expected of all IWM employees. You will also adhere to all corporate standards, and use corporate systems as directed to ensure consistency of service, brand and operational standards. You will be expected to comply with corporate standards, and use corporate systems, processes and procedures– and undertake any necessary training as directed. • SCANNING Flatbed To make scans of original Collections Photographs Section materials including prints, negatives (glass and film) and transparencies to agreed specifications and targets. You will also assist the team in the production of scans for other departments as necessary working to and following established workflow procedures within a colour-managed environment. • PROCESSING Photograph Section (Flatbed) After capture of the image you will process the data to an agreed specification creating a master file to represent the analogue original. • CAPTURE Black and White negative, documents, art etc, Using hi-end digital camera equipment (Hasselblad, Nikon) produce digital imagery of materials and post process the level required for use as “Master” images and after repurposing for access via Explore History facility and web site. General Dependant on the requirements of the job (specified by job sheet) you will source and repurpose images using Photoshop to colour balance, retouch, stitch etc. saving these to newly made delivery folders. • OUTPUT Taking note to work within the colour managed environment output repurposed files as required – email, disc, inkjet, digital print. • QUALITY CONTROL In addition to maintaining defined standards of capture and processing for your own work, you will quality assess the output of other operators and liaise with them over any image quality failures (your work will be similarly assessed). You will play an important role in ensuring that monitors and other equipment are calibrated regularly, as testing to ensure that reference standards and settings are maintained within a colour managed environment will form part of the duties. Training in the specifics of this will be available. • HOUSEKEEPING AND GENERAL You will be aware of the principles of conservation and ensure that the collections are cared for within departmental guidelines. As part of the workflow process you will manage the temporary storage and handling of archive material and safe return to the workflow co-ordinator on completion. You will be required to maintain an up to date production log and report on a weekly basis for project monitoring purposes. To maintain a constant flow of project deliverables you will liaise with the workflow co-ordinator as required and archive master and derivative files on the image server, in readiness for daily backup routines. During times of absence and sickness cover for the Digital Suite Manager. Maintain awareness of digital imaging practice, applications and innovation, advising department staff accordingly.